I feel like West Elm is constantly releasing new products and sometimes it can be hard to keep up. And to be honest, sometimes the “new” items look exactly the same as other current offerings with just a few tweaks usually not noticeable to the average consumer. BUT, among the latest new offerings from the major retailer are some stellar items that are unique, reference classic vintage and antique pieces, and look much more expensive than their price tags would suggest. Scroll on to check out some of my faves from their newest designs. Metalwork Bed. Cold rolled steel with an antique brass bar for good measure. Perfect for a bachelor pad. $899 and up. Clarke Leather Chair. 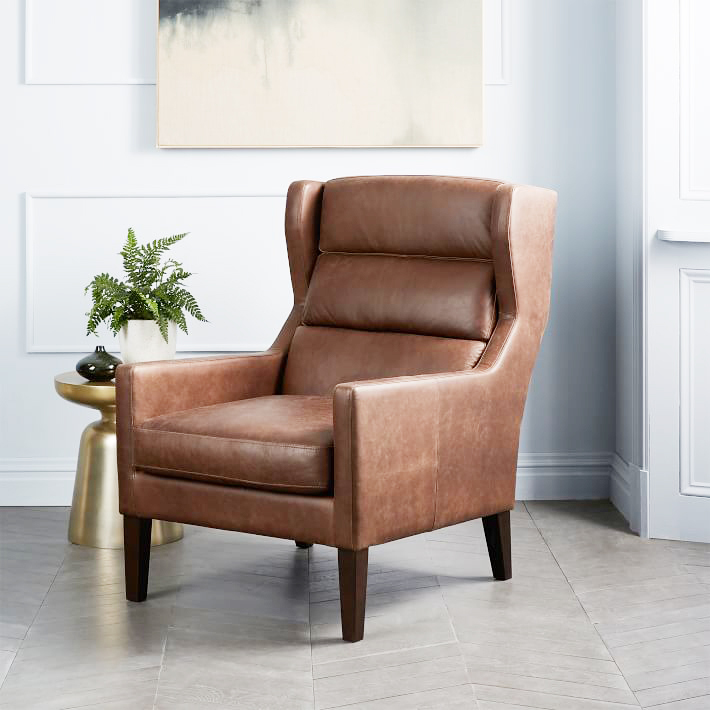 Recalls the shape of Midcentury leather wing chairs at a fraction of the price. Add a vintage pillow to maximize the character. $1299. Sculptural Glass Geo Chandelier. I love the various heights of the geometric shades on this fixture. This would add a little texture to the most streamlined dining space. $498. Lenox Leather Dining Chair. Delicate and feminine, I would pair these sleek dining chairs with a heftier wood table to add contrast and interest to even the smallest of dining spaces. $349. Sculptural Metal Table Lamp. It's no secret I love a brass lamp with a black drum shade. The unique shape of this lamp base will add personality and a sense of vintage flair to any dark corner. $179. Ring Sculptures. I love the inconsistencies and handmade-like quality of these metal accessories. Use them in a grouping for major impact or select a single size to incorporate into your bookshelves to add visual height and interest. $39 and up. Medina Rug. A twist on vintage Moroccan rugs, this 100% wool stunner has a thick and cozy pile in a fresh color palette that feels at once sleek and tailored as well as aged and handmade. $399 and up. Faceted Lacquer Coffee Table. Ok, how amazing is this piece? A combination of sleek white lacquer and heavily-grained wood, this is the ultimate textural and sculptural centerpiece for a living room. $599.